I had always been under the impression that the forces of air rushing out a broken window or hole in an airplane would be pretty limited and nothing near the levels necessary to carry a body through to the outside. The scene in Goldfinger has always been scoffed at by other pilots I have known. Seems fishy to me. Is this for real? Can you really be sucked out of an aircraft window? Remind me to buckle up. 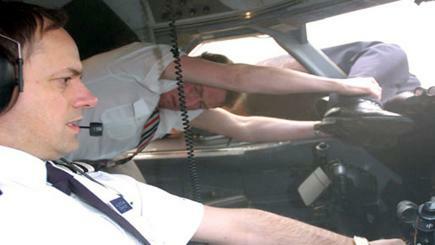 Gives a whole new meaning to the word "deplaning". There's also Aloha 243 where one cabin crew member was ejected, although that was a really extreme case.